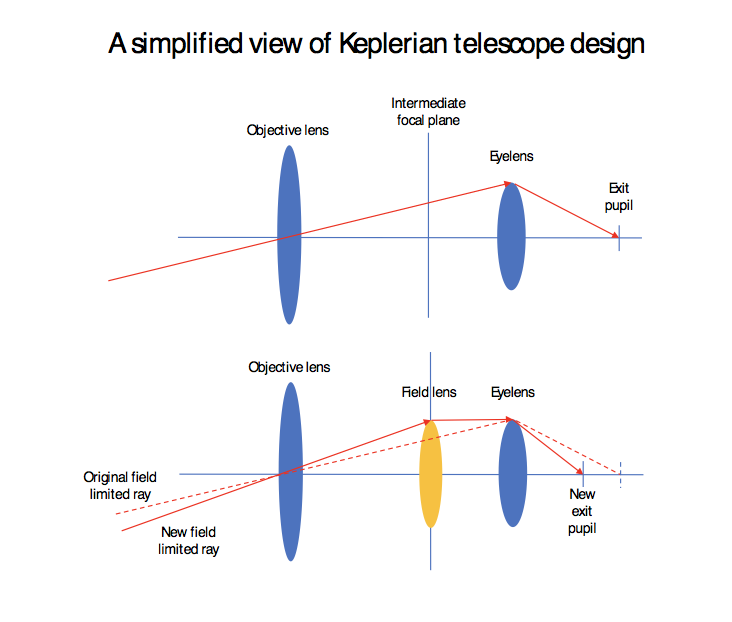 Notes about Keplerian ‘expanded field’ telescopes. Dr. Alan Johnston is an Australian optometrist and a 1985 low vision diplomate of the American Academy of Optometry. He practices in Melbourne, Australia. Keplerian telescopes provide additional benefits for bioptic use over Galilean types. Originally designed for astronomical use, Keplerians provide a wider field of view than Galileans of comparable magnification (Mx). Keplerian telescopes for astronomy provide a reversed and upside-down image, but for patients the image must be upright and translated left-to-right. Image inversion/translation was achieved at first using Porro prisms, named after their Italian inventor. Porro prism binoculars have the characteristic, dog-leg shape where the front lenses are more widely spaced than the lenses close to the eye. A more compact prism design is the lightweight Pechan-Schmidt combination, known generally as roof prisms, which have become popular in higher quality binoculars. Prisms offer the additional benefit of ‘folding’ the optical path hence shortening the physical length of the telescope. One restraint of Keplerian designs is eye relief— the distance of the exit pupil from the back of the telescope (the eyelens). This distance is usually about 9 – 10 mm (3/8”). The exit pupil is the image of the front lens (objective lens) of the telescope (see Fig. 2). It should be centered on the patient’s pupil and be positioned at the eye relief distance to achieve the widest field of view, which means that the telescope eyepiece must usually extend through the spectacle lens. Demonstrating a Keplerian telescope positioned in front of spectacles will usually limit the field of view width. Figure 1. 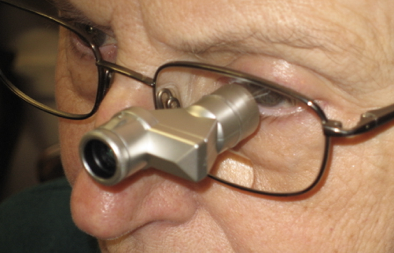 Ocutech 3x VES-Mini fitted through patient’s own lens drilled for accurate alignment. Ocutech miniature, bioptic telescopes including the VES Sport, Explorer (and now the Falcon Autofocus) use a unique, single penta-roof prism to re-orient the image. This design translates the optical path across the front of the spectacle frame, so that higher magnifications are achieved without an unwieldy forward protrusion away from the face. These innovative Ocutech designs are available in the VES-Explorer in 3x and 4x powers, and the recently redesigned Sport II is available in 4x, 5x and 6x powers. The VES-Falcon Autofocus is a 4x design—Ocutech’s most frequently prescribed power. 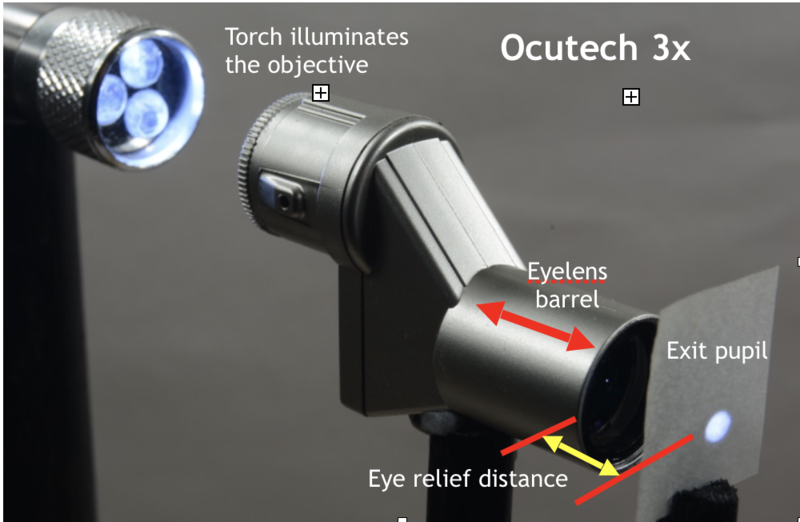 Ocutech also manufactures the 3x VES-Mini (shown in Fig 2) that provides the widest field of view in the smallest physical size of any 3x bioptic telescope. Figure 2. Eye relief is the separation between the rear telescope lens and the real image of the objective lens known as the exit pupil. I have used a small translucent screen (tracing paper, above) to image the exit pupil. How do Keplerian telescopes provide wider field of view? Keplerian bioptics are often referred to as ‘expanded field’ designs. The expanded field is achieved by the introduction of a field lens, an element placed near the intermediate focus position between the objective lens and the eyelens. This ‘captures’ rays from the periphery of the ray path that would otherwise not enter the eyelens. Field lens/eyelens combination has a precise, fixed space between them in the eyelens barrel assembly. The objective lens, on the otherhand, can be moved back and forth, to provide focussing on objects from optical infinity to as close as 10” (25 cm). Depending on the telescope design, use of a field lens almost doubles field width in Keplerian telescopes as compared to their simpler Galilean counterparts. Interestingly, introduction of a field lens does not alter magnification or telescope length, but it does shorten eye relief. Field lenses cannot be used in Galilean designs. It is also true that across many manufacturers, field of view in better quality Keplerian telescopes decreases as magnification increases but is fairly consistent for each magnification level. Occasional claims of ‘extra wide’ fields of view are exaggerations. In Figure 3 (below) I show these optics. I use a simple ray tracing comparison to demonstrate how introducing a field lens widens the field angle. Telescope performance depends on many factors such as aberration control, prism and lens multi-coatings, internal apertures and stops controlling stray light, and component precision. Bioptics usually provide magnification to a maximum of 6x – 8x. For practical reasons, magnification higher than this reduces field width and causes image movement that patients may find unacceptable. The new Explorer 3x has the same optical characteristics as the popular Ocutech Mini but has a mechanical frame mounting design that offers more flexibility in alignment. Both are focusable for different viewing distances but still maintain excellent field width (up to 15∞). VES-Sport and Explorer models require a slot in the spectacle lens for the eyelens barrel to protrude through. This is easily managed using a Dremel grinder and a stick-on template once the lens position is marked. High index lenses drill cleanly with no edge chips, whereas CR39 tends to be brittle. As an Australian optometrist, I chose Ocutech as my preferred bioptic range because I can slot and drill lenses easily in my own lab. When patients choose their preferred Ocutech design, I can provide a 24-hour telescope fitting service once the spectacle dispensing is complete. Previous PostPrevious Is the ORCAM really an “Artificial Vision Device”?